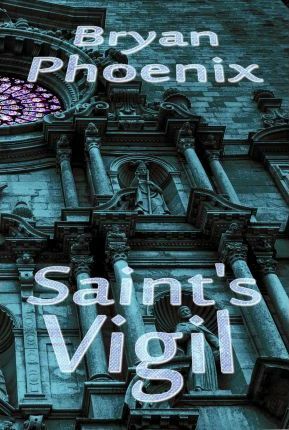 Bryan Phoenix Presents: Saint's Vigil, a novel of horror and suspense. Killed in a violent robbery, rescued and revived, a music teacher feels her loss is too much to bear. Panicked and broken, Saundra hides in Saint Michael's cathedral while law enforcement pursues the murderers. As darkness overwhelms her, she can only pray to the distant lights of heaven. Has she been cast into hell? In their terrible conflict, will the warring angels save her or destroy her? Called to the scene, Deputy Sheriff Hugh Miller entangles his team in a tactical nightmare, and his friends are killed and injured there. He saves Saundra from certain death by positioning himself between her and the assailants, but his use of force earns him a suspension. Inexplicably, the criminals escape. With the threat of more murders, Hugh joins the investigation in secret, obsessed with stopping the killers. His efforts place him in a deadly game poised to lose all he values and loves. Tracking seemingly supernatural events spiraling out of control, Hugh must find a way to bring them into his hand. Bryan Phoenix, a Contemporary American Literature Professor Emeritus now retired from the university, writes Horror and Suspense stories. Secretly writing for years, yet now freed from the confining shackles of his former masters, Bryan has decided to unleash his skeletons upon the public.